Only 20 Days Left For Utopian Colony on IndieGogo! Share It Among The Open-Source Community!! Okay, let's be completely honest here for a minute. Things are not going too great with the Utopian Colony IndieGogo campaign. 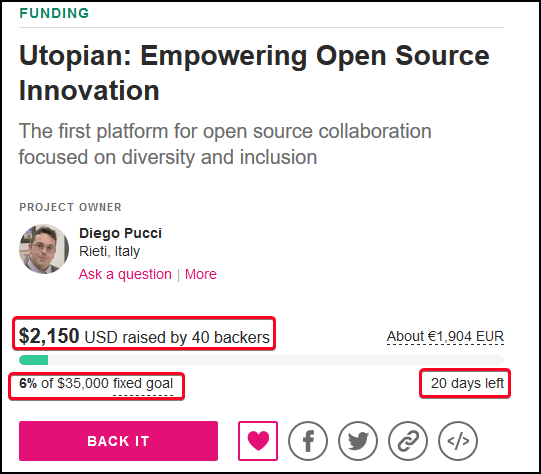 They're far behind on schedule to reach their $35.000 target on IndieGogo and with only 20 days left before the crowdfunding campaign is inevitably over, some additional effort is needed to turn this into a success. While many people have put in a lot of effort into promoting this campaign on various social media websites and on the Steem platform, I haven't seen too many people reach out to the wider open-source community. In my opinion, getting the attention of different open-source projects, is the only way we're going to see Utopian Colony funded on IndieGogo. 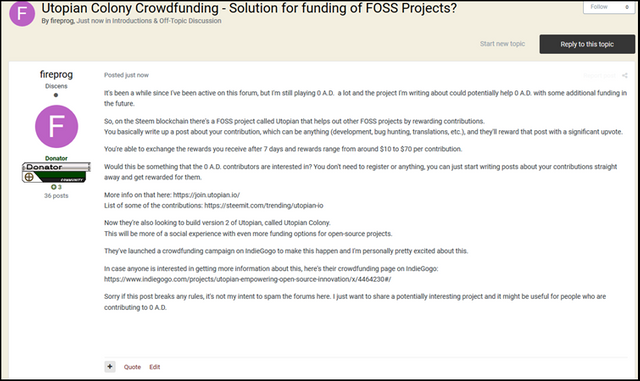 Utopian itself got the right idea when they posted this thread on /r/opensource, but as you can see the thread hasn't exactly gone viral. More effort is needed from the community and it's about time that we start putting in some additional effort, because the clock is ticking! Are You Part of an Open-Source Project? Surely there must be some people here on Steem that are already part of an existing open-source project? Have you thought about sharing the Utopian Colony IndieGogo campaign on your project's forums or Slack? Even if you're not a contributor, you can still share this crowdfunding campaign in a non-spammy way with people who might be interested in hearing about it. For all we know, there are open-source projects out there who have never heard about Utopian and would be more than willing to contribute. There's still just about enough time left to let our voices be heard by the large FOSS community! I've been a long time member of the 0 A.D. forums and I've decided to write a detailed forum post there about Utopian. Instead of just focusing on sharing the crowdfunding campaign, I wrote a relatively long post about what Utopian does and I only mentioned the crowdfunding campaign at the end of the post. Besides this, I've also made two separate threads on the Bitcointalk forums, one of which got a little bit of attention from forum members. I know that there are people here on Steem who are also members of Bitcointalk, so if you could add a reply to one or both of these threads, I would be very grateful!. To see how many pledges your promotional efforts have brought in, you can go to your IndieGogo profile and check out the 'Referral' section. There you can see exactly how many people have contributed via your referral link. I'm pretty happy with my stats, but ideally I'd like to increase them until I've 'contributed' at least $400 in pledges. I would recommend to also set goals for yourself, if you're adamant on seeing Utopian Colony succeed on IndieGogo. I'm not ready to throw in the towel just yet! It might seem as though we're not going to reach the funding target, but anything can still happen. Especially if we find better ways to promote the Utopian Colony IndieGogo campaign. Do share your own efforts in the comment section below! I will be giving out rewards to the people who've contributed the most, past promotions also count. Don't forget to pledge yourself, if you haven't done so already! This campaign is now also available on Fundition! I am really shocked that this hasn't been picked up on more. I might go off on a little rant here, but I can't fathom how this is not getting more support. I feel like there are literally hundreds of users submitting stuff to @utopian-io each day. I have made submissions to Utopian three times in my life and two of them netted me little if no rewards while the other one got me only about $20. I still believe in what Utopian is doing so I gladly donated $25 to the Indegogo campaign. A quick look at Steemworld shows the Utopian-io account has given out numerous votes in the past hour ranging from $2 to even $50 in some cases. With hundreds of people contributing and benefiting from the services and upvotes that Utopian provides on a daily basis, why are not more people giving a little of those rewards back to make Utopian even better? Yeah, I don't understand it either. I think there are at least 100 people who've received rewards from Utopian in the past month or so. Really weird that contributions to the IndieGogo are still sitting at $2.000 with only 40 backers. I feel people only want to reap and not sow. Personally, I know the advantages I'd get when the colony is finally in place, but I contributed not only because of future advantages. Since August last year, or thereabout, all my publications on the blockchain has been contributions on Utopian. I can say that it is my home on the blockchain. I wouldn't want to lose my home. I don't know how else to ginger people to back the campaign. But, I know for sure that, if Utopian or any other person makes this a contest, it would get reasonable backings, or maybe not. Oracle-d tried a contest, and from what we've seen recently, people would only talk or contribute just to get the gains in it. Your UA account score is currently 4.118 which ranks you at #3324 across all Steem accounts. Your rank has improved 4 places in the last three days (old rank 3328). In our last Algorithmic Curation Round, consisting of 354 contributions, your post is ranked at #243.